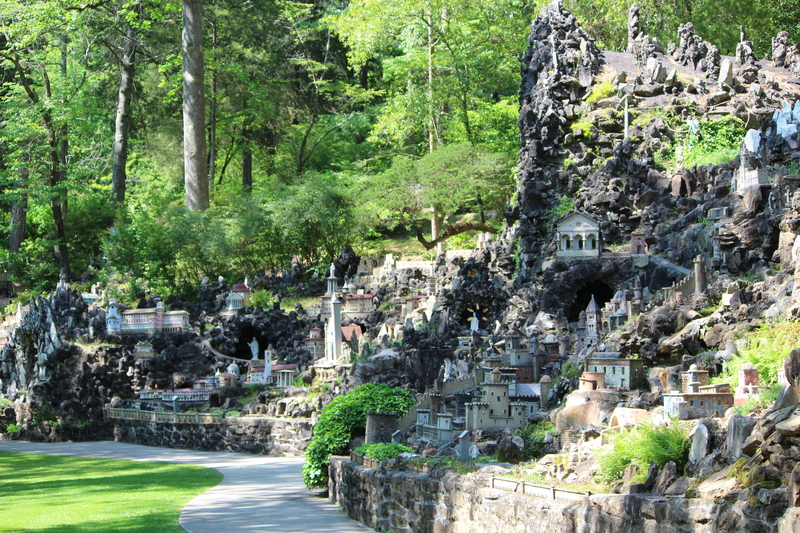 Turning cast-offs into cathedrals: the remarkable work of Brother Joseph at Ave Maria Grotto | Oh, the Places We See . 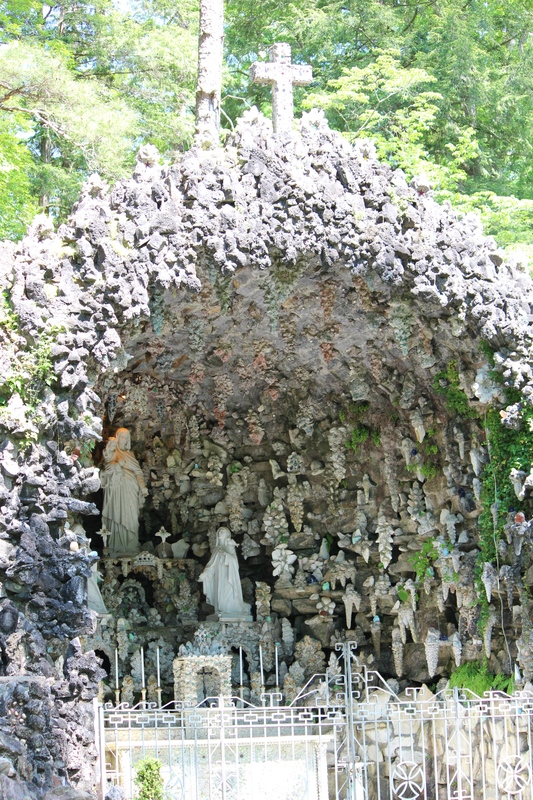 . .
Perhaps one of the most fascinating sites to see in America is one that may not be well known: Ave Maria Grotto in Cullman, Alabama. 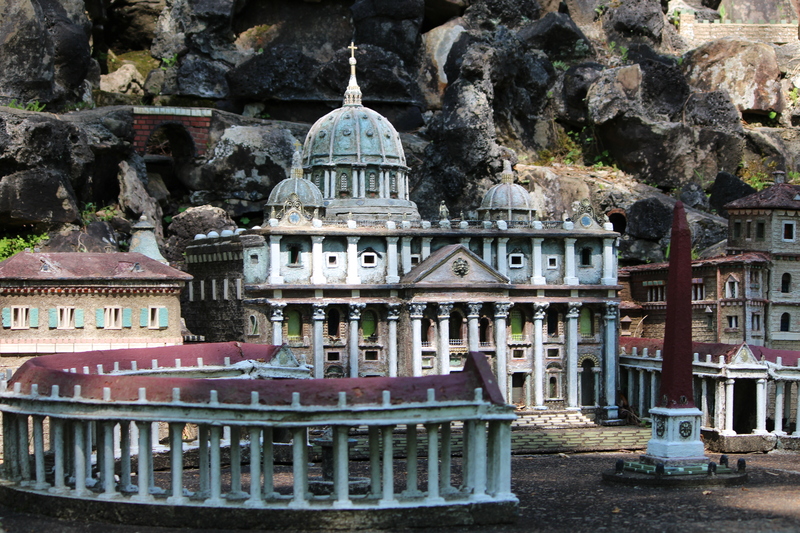 But with over 125 miniature buildings and shrines built with the infinite patience and creativity of one Benedictine monk, Brother Joseph Zoettl, Ave Maria Grotto could be one site you will never forget. 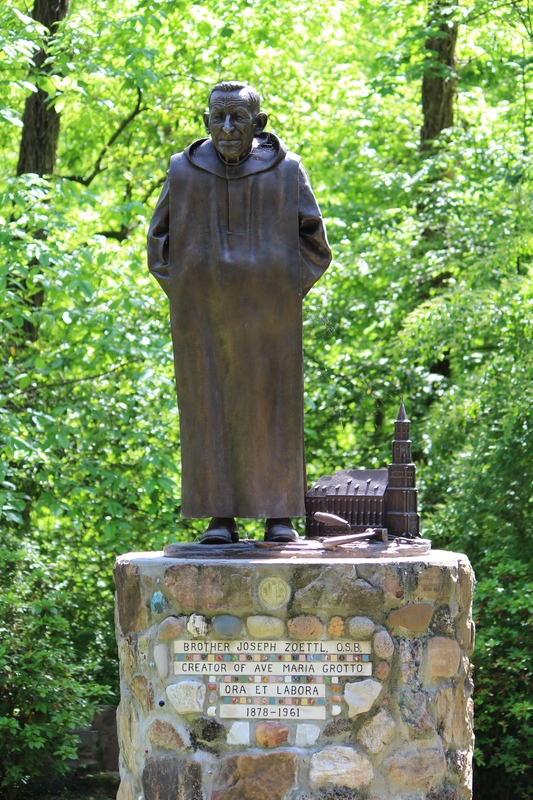 Born in Bavaria, Joseph Zoettl left his home at the age of 14 to come to America, specifically to St. Bernard Abbey in Cullman, Alabama. 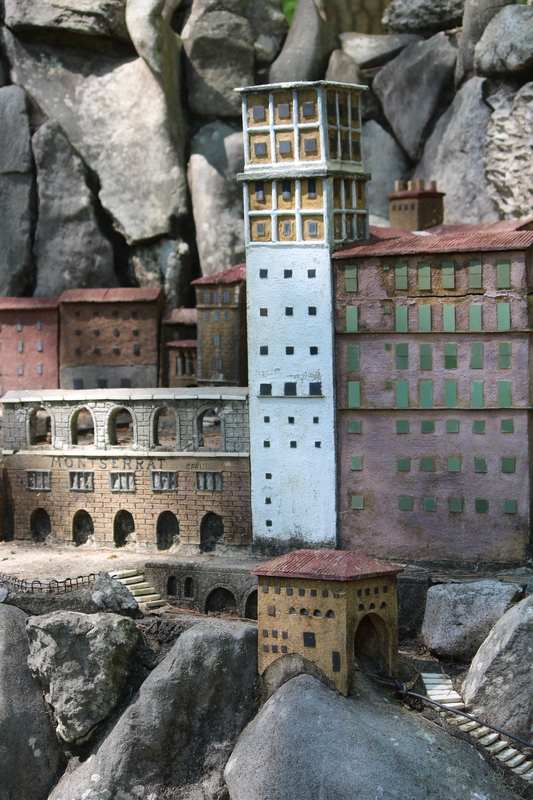 After an injury left him hunchbacked and almost incapacitated, he was assigned to working long hours alone in the pump house where he began his hobby of making miniature buildings with little more than cement and found objects. 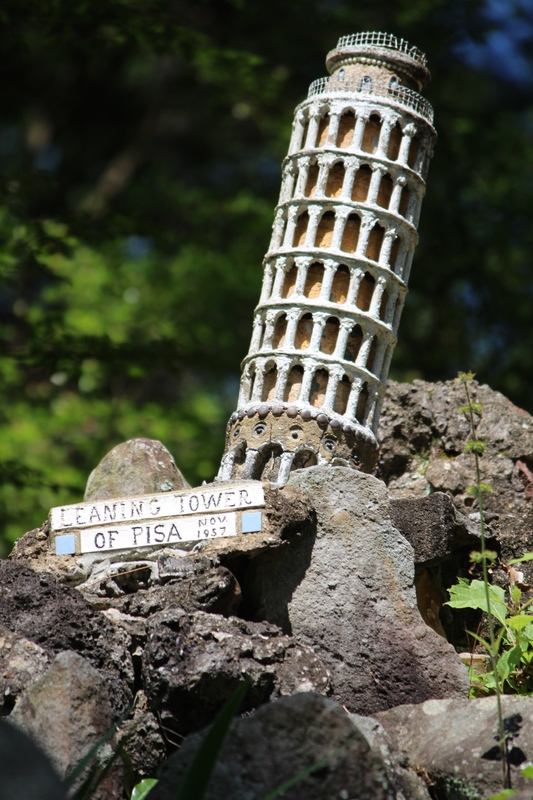 People heard about the tiny buildings and sent him things — shards of glass, toilet floats, cold cream jars, shells, and all manner of found objects — which he incorporated into recognizable, well-known buildings and replicas of famous sites that he had seen only on postcards. Father Joseph, you see, never traveled beyond the abbey. 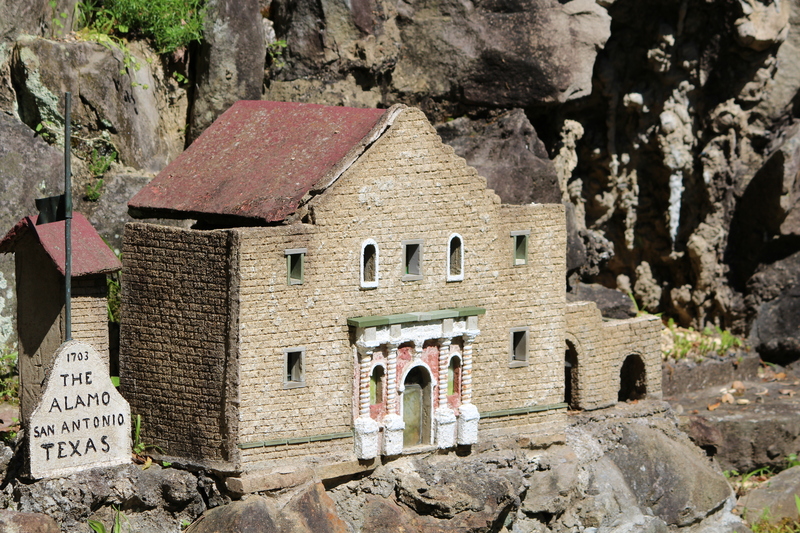 At first, the replicas were displayed on the grounds, but when the number of visitors who wanted to see the little buildings swelled, the Ave Maria Grotto was constructed in a quarry encompassing over three acres to hold all of Father Joseph’s work. 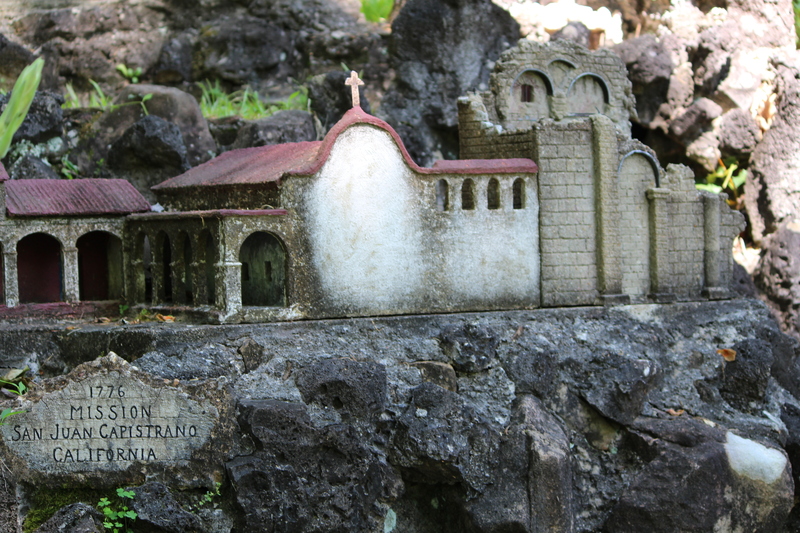 Gazing at one of several walls of miniature buildings in Ave Maria Grotto. 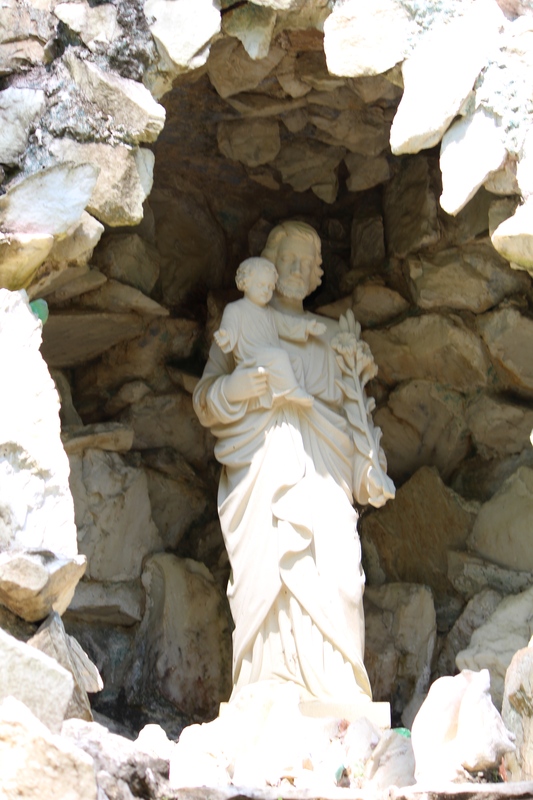 Long after the dedication of Ave Maria Grotto (also known as “Jerusalem in Miniature”) in 1934, Father Joseph continued his work until his death at the age of 80 in 1961. 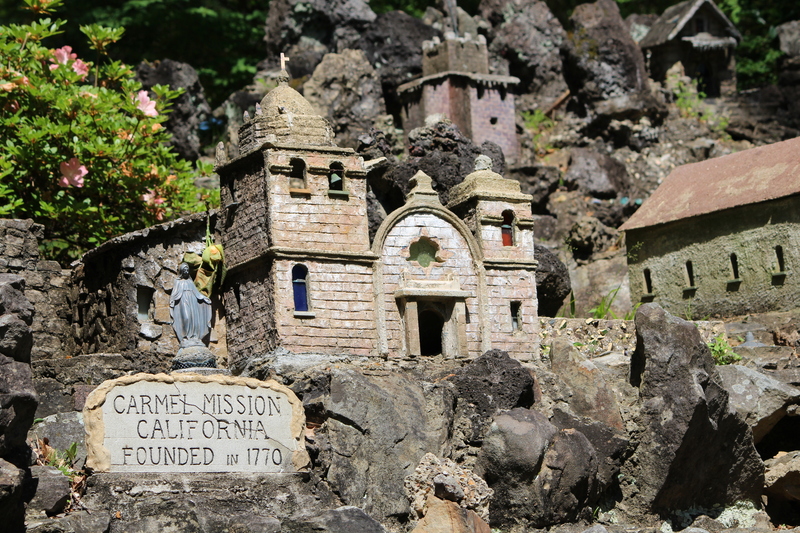 People from all over the world had sent him materials, visited the grotto, and praised the creative work of one man whose vision of creating a miniature fairyland continues to bring pleasure even today. 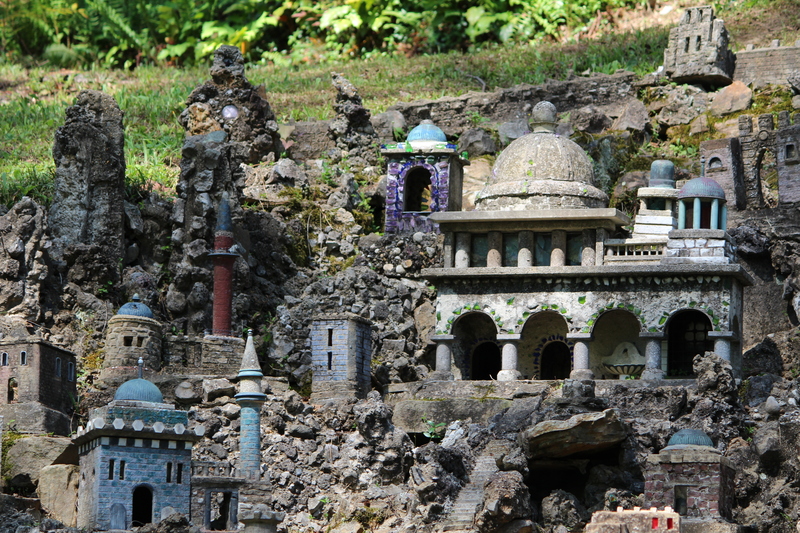 Set into stonework, the miniatures are somewhat grouped by the area of the world where the originals are located . . . like these from the United States. Or these from Europe . . .
One whole section is dedicated to buildings and sites of the Holy Land . 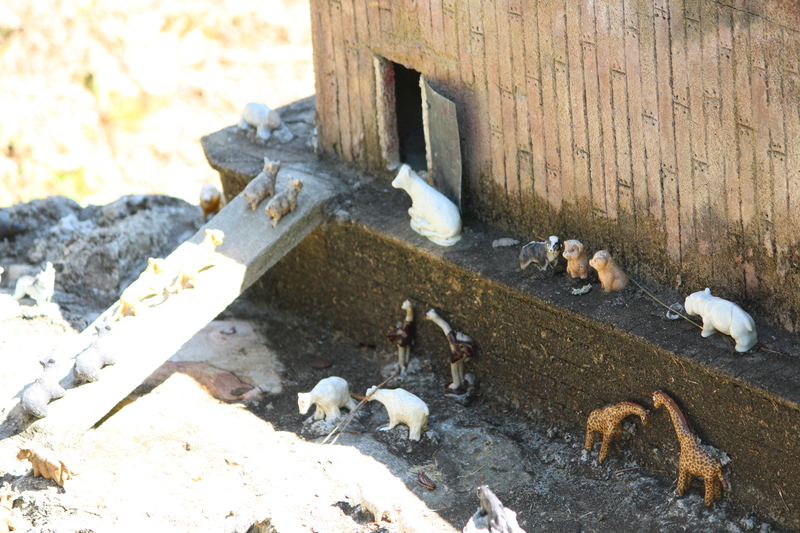 . .
A replica of Noah’s Ark complete with tiny animals moving two by two has become a personal favorite. 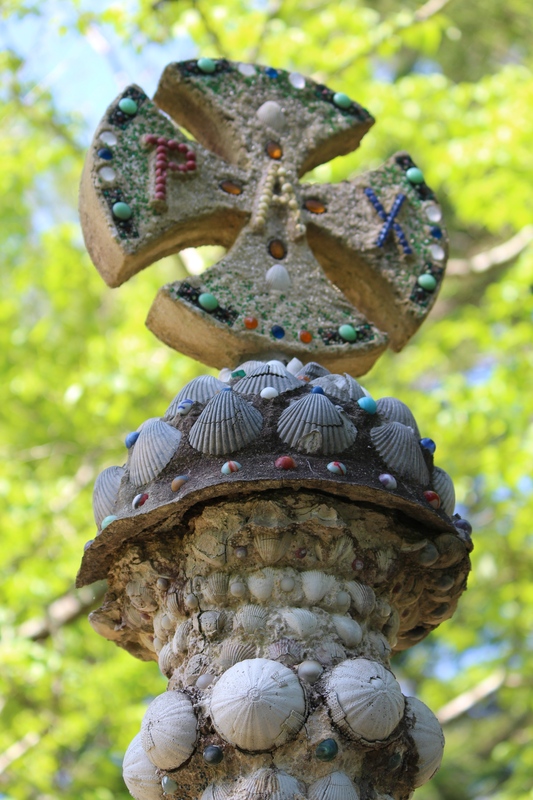 Although there’s a calmness surrounding this serene area, it’s not without humor. 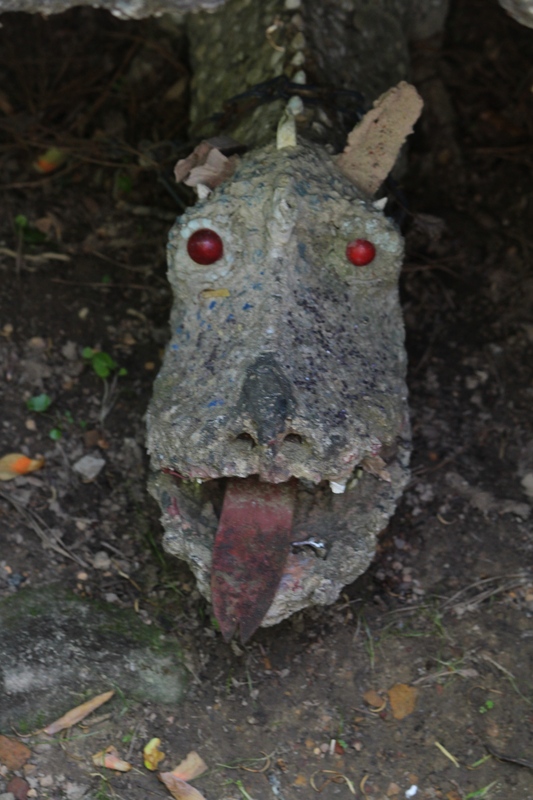 For example, a “folk artsy” old dragon head pokes out from underneath one of the buildings. 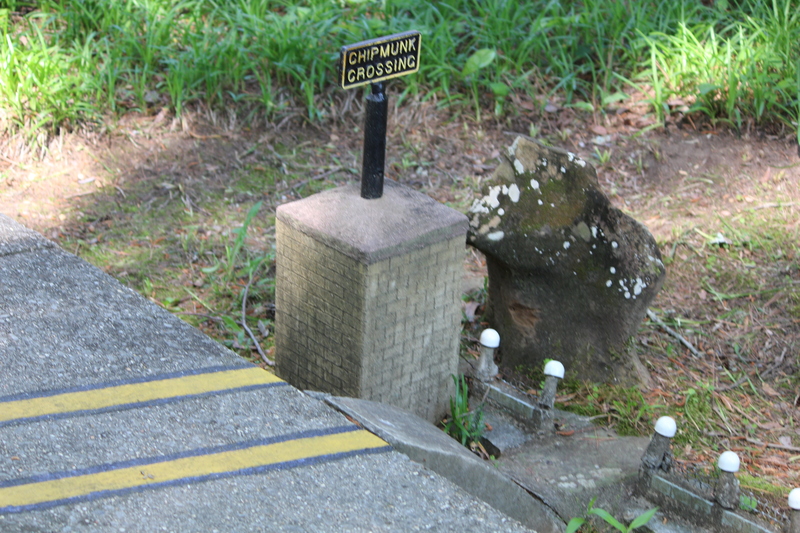 And a crossing for chipmunks provides a unique pathway for small creatures on the way to somewhere else. 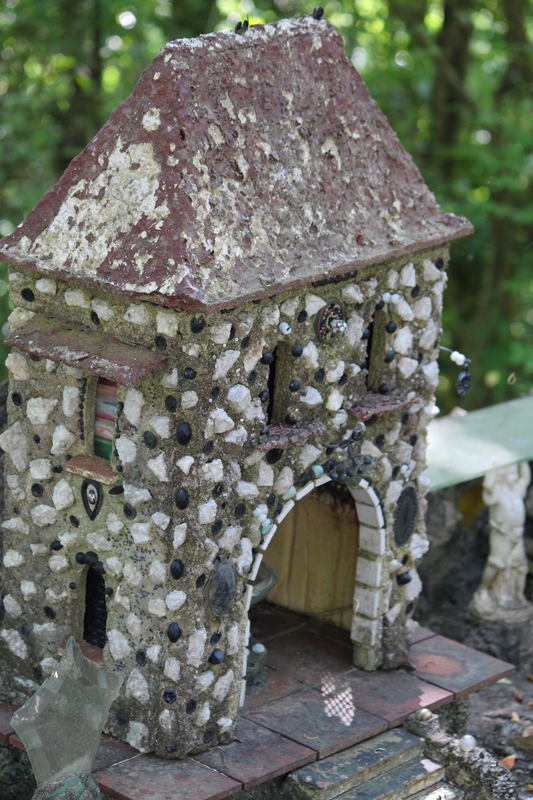 According to Roadside America, Leo Schwaiger, a man who has worked at Ave Maria Grotto for 40 years and apprenticed alongside Father Joseph, maintains the miniature buildings in his spare time. 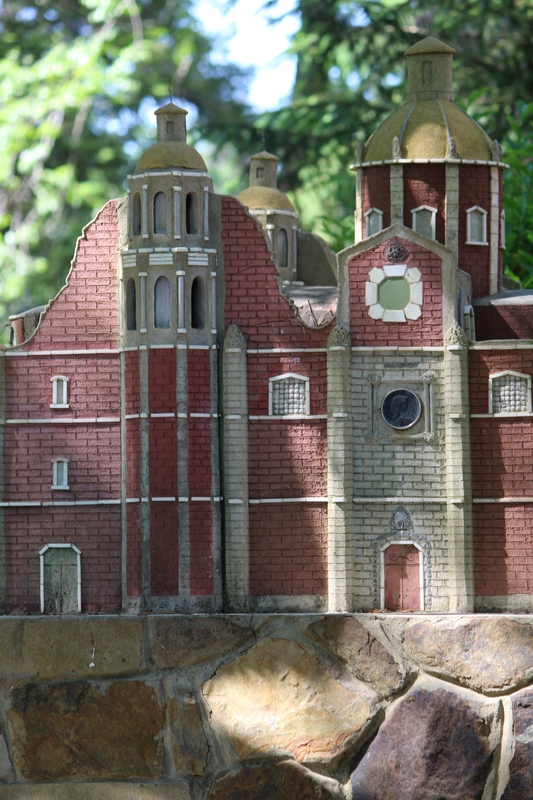 And he’s also built some of his own, using the same design inspiration Father Joseph used: postcards! 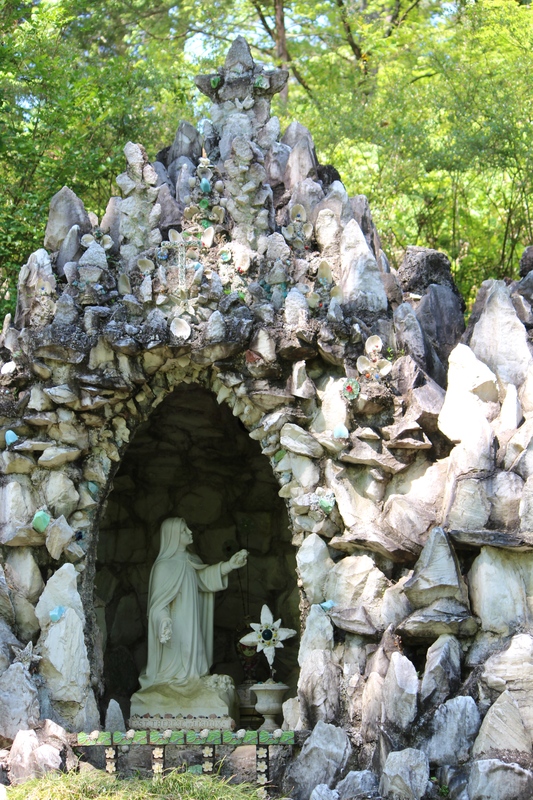 If you’re traveling through the South, put Ave Maria Grotto on your list of places to see. 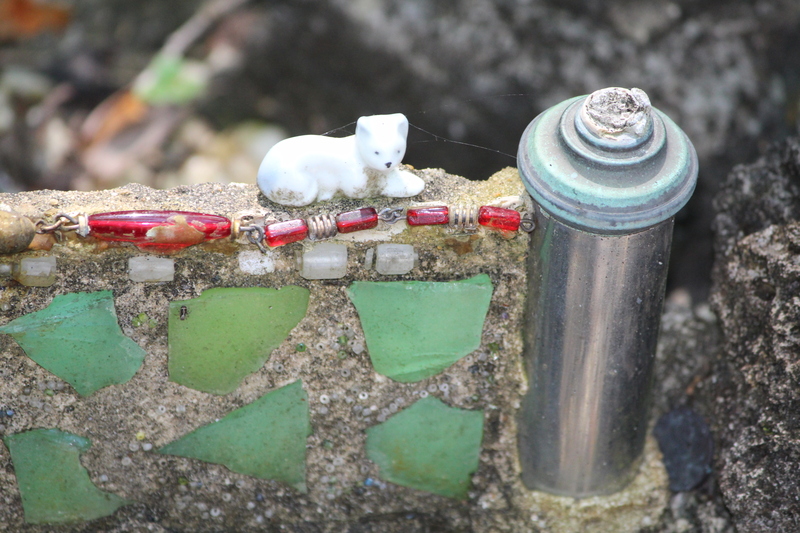 You’ll recognize some of the world’s famous architecture, but you’ll also be charmed when you see it dotted with marbles . . . or plastic statues . 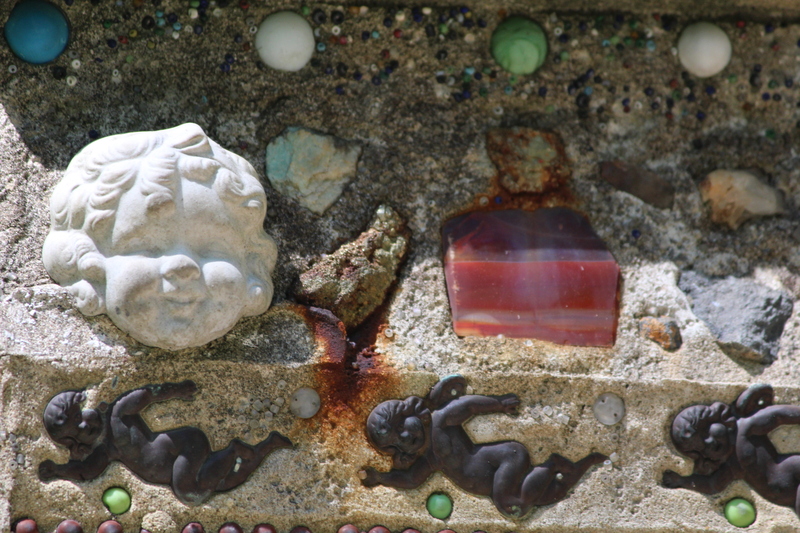 . . or cherubs. And we’re pretty sure you’ll be fascinated by the accomplishments and ingenuity of Father Joseph. Open daily 9 to 5. Closed Thanksgiving Day, Christmas Day, and New Year’s Day. Be sure to watch the movie in the Welcome Center first. 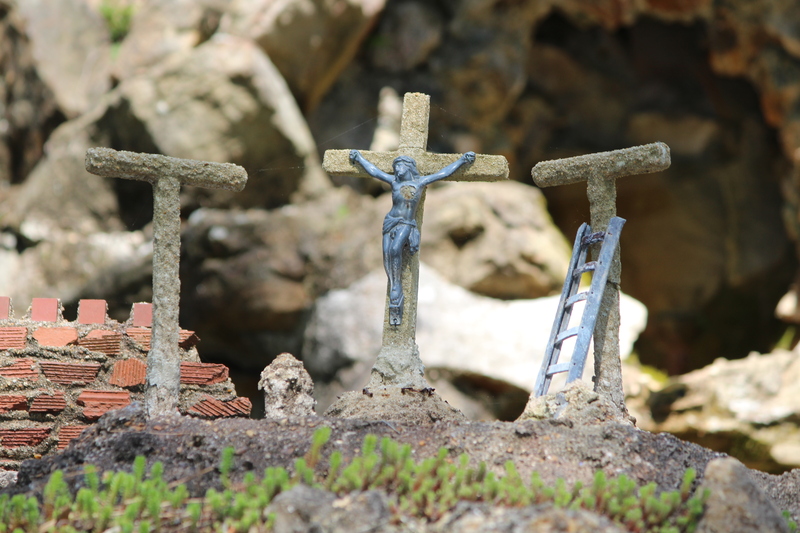 You’ll get the background of Father Joseph and documentary footage showing how some of the pieces were created. The park is accessible for people of all ages with nicely paved sidewalks and ramps. However, a few areas are a bit steep. Caution is always advised. 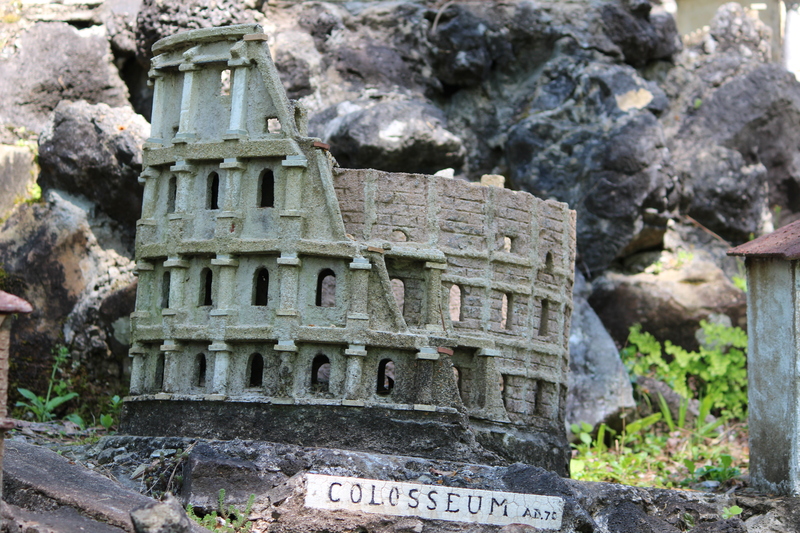 Admission is $7.00 for adults, but only $5.00 for Seniors and AAA members. 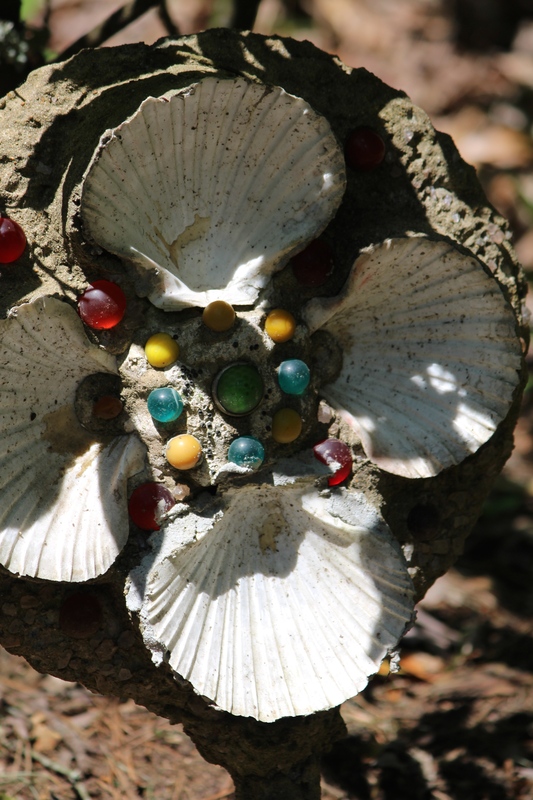 For more information, check out the website for Ave Maria Grotto. 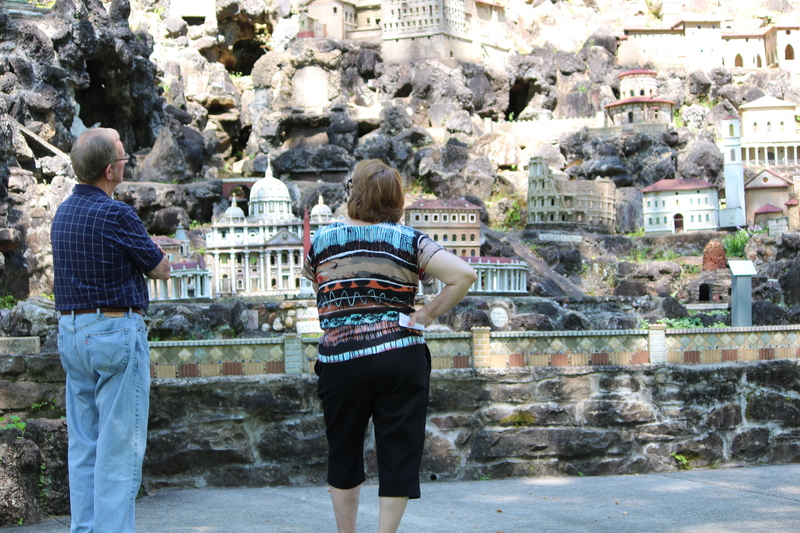 *Boomer Travel Tips for sight-seeing destinations are now included on Oh, the Places We See. Hope you enjoy! 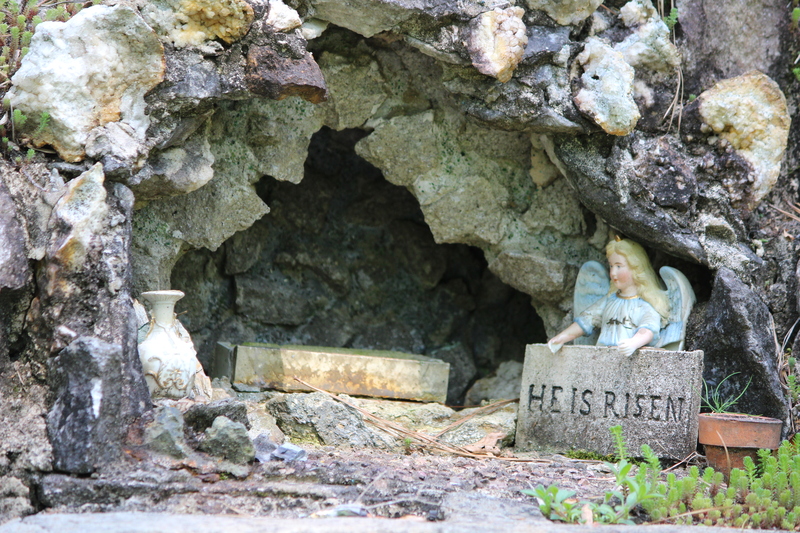 This entry was posted in Alabama, The South, Travel and tagged Alabama, Ave Maria Grotto, Cullman, Father Joseph, Joseph Zoettl, miniature buildings, shrines, St. Bernard Abbey. Bookmark the permalink. It really is a fascinating place. And, if you go, be sure to watch the video first. Love the story of this one man and all he accomplished over the years. But also proud that the creations have been put on display for everyone to see. Thanks for reading! A wonderful tribute to a life’s work. I had never heard of this little gem. Lovely!! You’re so right, Martha. It IS a little gem. Why have we never heard of it either? It’s truly a sweet spot to visit. Thanks for commenting.